Alfred Clark Chapin graduated from Williams College in 1869 and from Harvard Law School in 1871. A successful lawyer, he was also active in politics and for many years was a trustee and benefactor of his alma mater. In March 1915, while visiting the New York antiquarian bookseller James F. Drake, he was shown among other works a superb presentation copy of the Eliot Indian Bible (Cambridge, Massachusetts, 1661, 1663), the first Bible printed in what would become the United States. It occurred to Mr. Chapin that a well-rounded collection of important books, in various fields and in original or early editions, could be of great value to the students of Williams College, who by intimate contact with works of historic and cultural importance might gain a richer appreciation of their world. This was a very remarkable idea: no one ever before had conceived such a plan in connection with an educational institution in the United States. With the approval of the President and Trustees of the College, Mr. Chapin proceeded to create for Williams a special library broadly divided into incunabula (15th-century printed books), Americana, English and American literature, continental (European) literature including Greek and Roman classics, Bibles and liturgical works, illustrated books, and science, with a selection of early manuscripts, broadsides, prints, and necessary reference books. In the course of eight years Mr. Chapin acquired some 9,000 volumes, as well as manuscripts and historical prints, which were kept in storage until suitable rooms could be built. These too he provided, on the second floor of Stetson Hall, then the new College Library building, designed by the distinguished Boston architects Cram and Ferguson. On February 1, 1923, by deed of gift, Mr. Chapin formally presented the library he had formed to the President and Trustees. On February 2, 1923, the Board of Trustees accepted Mr. Chapin’s donation with gratitude. Many letters were received from Trustees and administrators praising Mr. Chapin’s generosity and vision. 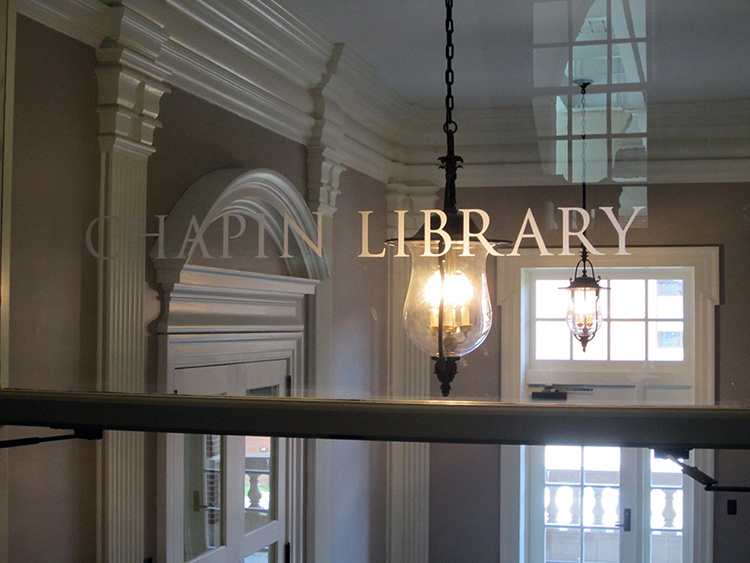 The Chapin Library opened to the public on June 18, 1923. Before his death in 1936, Mr. Chapin added another 3,000 books to his original donation. Since then, the Library has grown by gift and purchase to some 60,000 volumes, together with more than 100,000 other items: manuscripts, prints, drawings, paintings, maps, photographs, bookplates, ephemera, and memorabilia. As a library whose mission is to support the liberal arts curriculum of Williams College through original materials, the Chapin naturally has developed in periods and subject areas beyond those with which Mr. Chapin was concerned, such as Women’s History and African-American Studies. The first Custodian of the Chapin Library (the first official title for the head librarian or director), from 1923 to 1947, was Lucy Eugenia Osborne. In addition to conceiving the original organization and inventory of the Library, she compiled A Short-Title List of the Books in the Chapin Library, Williams College, published in 1939, and notably translated Konrad Haebler’s Study of Incunabula (1933). The second Custodian (1947–1955) was Mary L. Hurt Richmond, later best known for her important Shaker Bibliography (1977). She was followed briefly (1955–1957) by Thomas Randolph Adams, who went on to a long career at the John Carter Brown Library of Americana at Brown University. Adams was succeeded by H. Richard Archer, an expert on printing history, who served from 1957 to 1977. Robert L. Volz was the Custodian from 1977 to 2015 and oversaw an expansion of acquisitions (including the single most significant purchase by the Library, of an original printing of the Declaration of Independence) and endowments, ensuring a sustainable future for Chapin Library collections. Oral history interviews with Mr. Volz in 2000, 2009, and 2015 elaborate on the history of the Chapin Library. The current Chapin Librarian (since 2015) is Wayne G. Hammond. The Chapin Library’s holdings are stored and cataloged distinct from those of other libraries at Williams. For most of its history, the Library was maintained as a separate department of the college, under the office of the President or the Provost; since July 2014, it has been an administrative unit of the Williams Libraries. Since July 2008, it has been partnered with College Archives and Special Collections, a unit created originally to manage Williamsiana (materials documenting the history of the College), but later charged also with administering rare books and other special collections held by the College Library. 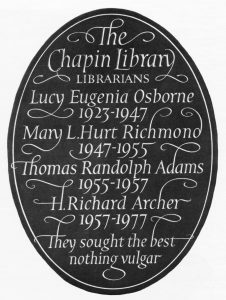 Some of the latter materials were at Williams before the Chapin Library was founded; others came to the College Library because they were felt to be out of scope for the Chapin. In 2016 the Chapin Library and the College Archives were joined administratively as the Williams Libraries’ Special Collections Department. The motto on the commemorative slate tablet shown at right, They sought the best, nothing vulgar, was suggested by H. Richard Archer, who commissioned the tablet from the Kindersley Workshop of Cambridge, England. It is meant to suggest that the Custodians (Chapin librarians) since 1923, and before them Mr. Chapin in forming the Library, have always been sensitive to issues of quality – the importance of a text, for instance, or the condition of an artifact – as well as concerned with good taste. Dr. Archer, however, could not recall the source of the motto, and none has been discovered in later years.